the Iowa Association of Railroad Passengers. Meeting will be held at the Hotel Ottumwa in Ottumwa, Iowa from 11:30am to 3:30pm. Limited menu to choose from at the beginning of the meeting. Minutes from the July 2011 meeting. February 2011 Newsletter with meeting schedule. National Train Day in Des Moines, Iowa, May 9, 2009. 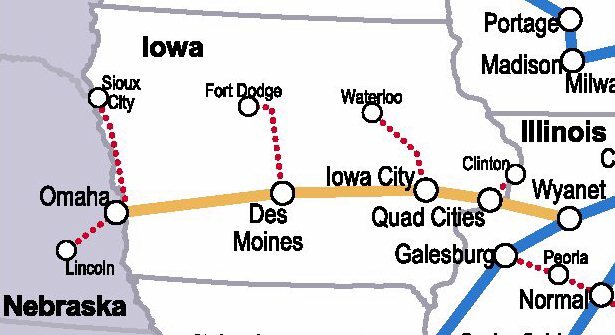 Amtrak to Iowa City-Quad Cities-Chicago feasibility study 2008. Dana Grefe's Iowa Railfan Guide Reviewed by George F. Davison, Jr.
Grade Crossing Law Synopsis by George F. Davison, Jr.
Iowa RR Radio Frequencies by George F. Davison, Jr. The contents of these Web pages are copyrighted by IARP. Commercial duplication of any material contained herein is prohibited without the prior written permission of IARP.